I tried the auto recyclers with no luck. I opted for rebuilt calipers from Pep Boys for $39.99 + $20 core. This was nice because there were clean and already fully rebuilt. By the time I had wasted a day in the wrecking yard, bought used parts, cleaned them and rebuilt them, I’d probably be at the same (or more) price. These came in ‘like new’ condition. 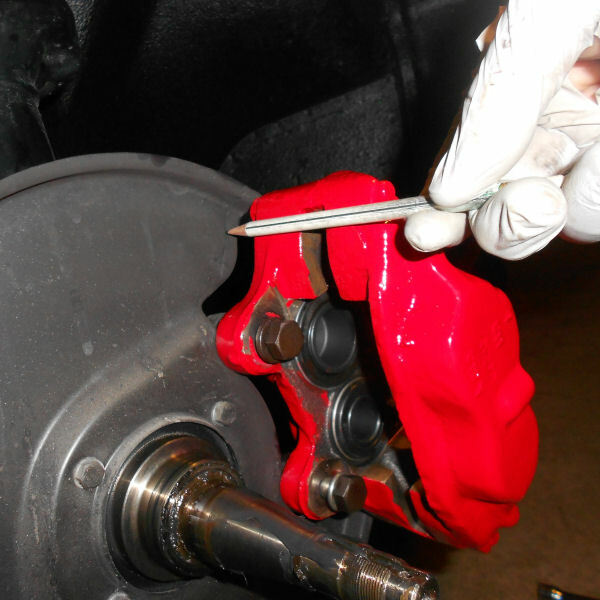 I painted these red using the Eastwood Ceramic Brake Caliper Paint. The kit was easy to use, and the instructions were clear. Two coats left a smooth, glossy finish. To make life easier, I made little “L” shaped plywood stands to hold the calipers during painting – it made the process so much nicer. I removed old brake caliper and ‘S’ hard line. I took off the rotor. With the dust plate still in place, I loosely mounted the new calipers on the wrong side- that is, toward the outside of the wheel. This would allow me to run a pencil along the contour of the caliper and trace this onto the dust backing plate. Using my right-angle-grinder, cutoff disks, grinding disks and a flapper disk, I carefully cut back the backing plate in a natural shape that follows the outline of the calipers very nicely. 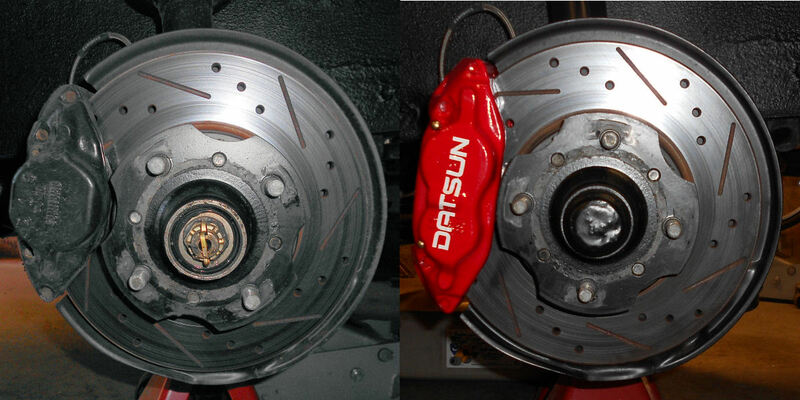 The Toyota disk brake calipers install perfectly as promised. There is a ‘right side up’ for these calipers, they MUST be mounted with the bleeder valve upwards. 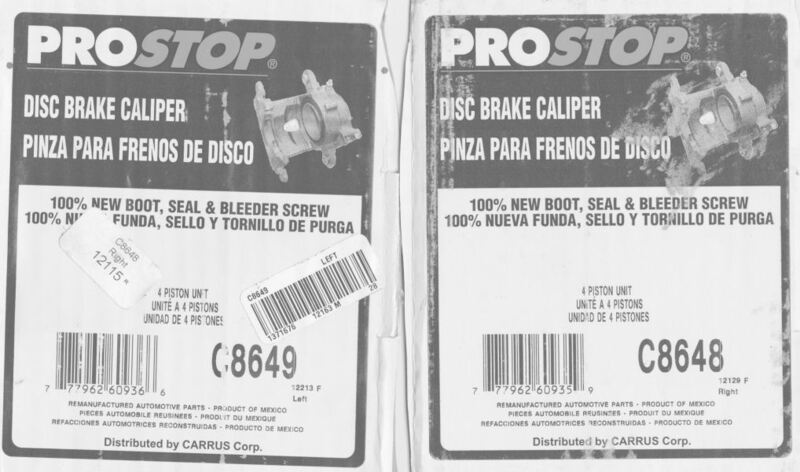 It is possible to swap sides, and with the bleeder at the bottom, you will NEVER be able to bleed all the air out of the caliper. I used some scrap solid copper wire (12 gauge house wiring) and made a “3D” model of exactly the shape I wanted. Due to the size of the new calipers, the old, simple “S” shape would not work. I started with 8″ brake line, pre flared. The bends are very tight and very close to the nuts. 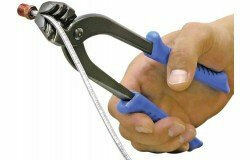 The Eastwood Brake Line Forming Tool was the perfect tool for the job. No kinking, very tight turns, very close to the nut. I would rate this a “must have” for this job. The decal was from TunerDecals.com. As “Datsun” was not a standard logo, I designed a custom decal that I felt somewhat matched the era. It was super-easy to apply, but care is recommended. To be double-safe I clear-coated with a high temperature clear spray paint. 3 years now, and holding up perfectly. Since this modification changes the front/rear braking dynamics, especially for any type of racing, consider an adjustable proportioning valve like Wildwood.